I think this is a decent proof of concept, small "lean" sample size notwithstanding, and I want to talk a bit about what went right and what went wrong, and how I can improve if I want to keep doing this sort of thing. 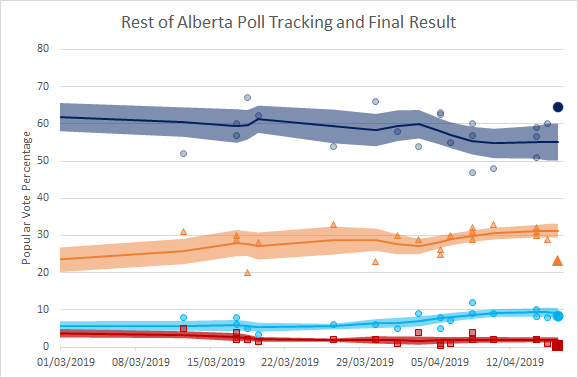 Edmonton was remarkably accurate, Calgary was close, but the rest of the province and the top line results were off significantly. This is possibly a cause for concern, as it could suggest that my model was taking inaccurate data as inputs but then claiming credit for an accurate output, which it wasn't designed to do. 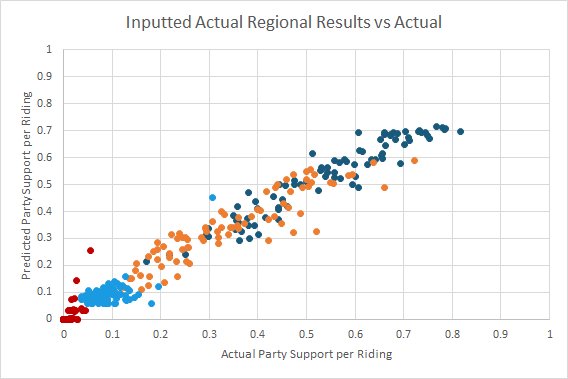 The NDP ended up under-performing relative to their polling numbers, and likely the only reason this didn't mess up too many election prediction models is because they under performed mostly in areas like rural Alberta, where they were predicted to lose anyway. If the polls had been that wrong about the NDP in Edmonton, say, the predictions could have been far worse. 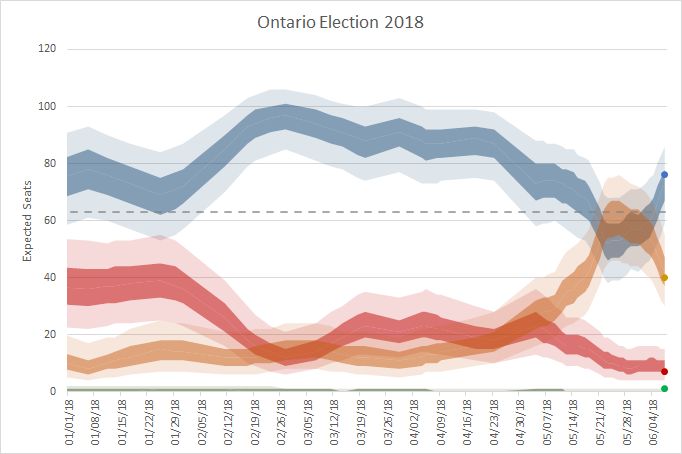 Similarly, my model and others like me likely wouldn't have fared too well if the NDP had overperformed their polling rather than underperformed. 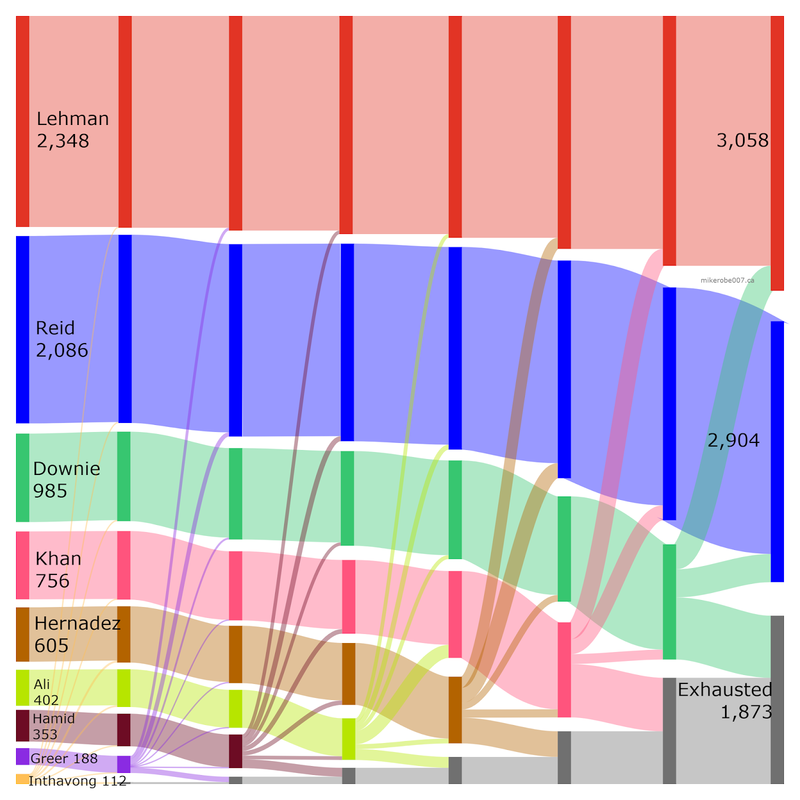 The same amount of polling error as actually occurred, applied the other direction, could have had the NDP win the popular vote across the province. My takeaway from this is that I need to adjust my topline polling tracker. Right now it runs under the implicit assumption that errors in individual polls will cancel each other out. This seemed reasonable given that polls are produced by different companies with different methods. 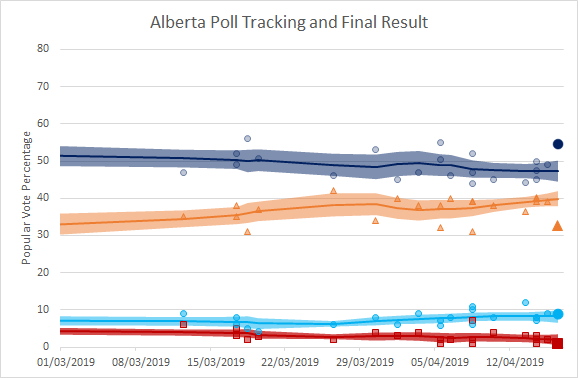 That led to my full Alberta tracker having a low confidence interval for the NDP in particular, though, as several polls in a row provided the same result. If I instead make the assumption that at least part of the polling error is correlated between polls, perhaps due to something beyond their control, then the final result from election night would have still been a surprise, but far less of one. Certainly something I'll take into account next time. If we ignore the Alberta Party and the Liberals, this leads to an overall R-squared value of 0.79, which I consider respectable. It's handy to ignore the low parties because they don't have much of a spread, and will skew the coefficient of determination calculation. Very fortunately for me, if I input the final actual regional results as though they were a poll result, my model does improve. This is a good hint that my model is behaving decently, especially so since this hasn't been the case with all other forecasters. 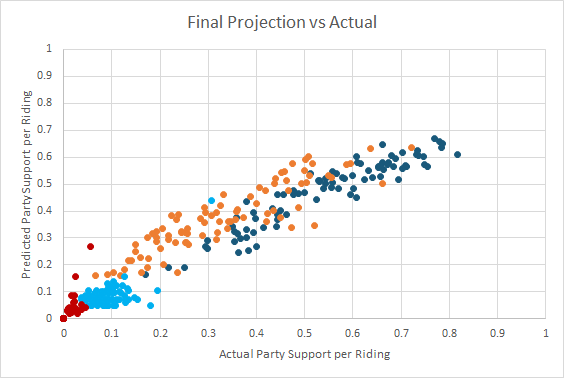 With the correct Calgary, Edmonton, and Rural results input as large polls, my model improved to 83/87 seats correctly predicted and an R-squared for party support per seat of 0.91. Very encouraging - too bad the polls weren't more correct! Finally, I also provided an expected odds of winning each seat for each party. 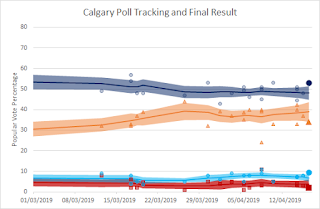 It's one thing to count a prediction as a success if you give it 100% odds of winning and it comes true, but how does one properly score oneself in the case of Calgary-Mountain View, where I gave the Liberals (10.8%), UCP (16.2%) and NDP (73%) different odds of winning, and only one (NDP) did? In this case I've scored each riding using a Brier score. A score of 0 means a perfect prediction (100% to the winner and 0% predicted for all losers), a score of 1.0 means a perfectly wrong prediction (100% to one of the losers), and because of the math, a score of 0.19 for a complete four-way coin toss (I only predicted the four parties represented in the debate). Overall, I scored a 0.027, which is considerably better than just guessing. It's hard to get an intuitive sense of what that score really means, but it's mathematically the same as assigning an 83.5% chance of something happening and having it come true. Not a bad prediction, but there's room to be sharpened. How did I stack up? So like I said, there were a lot of us predicting the election this time around. I've tried to find as many as I can, and I apologize profoundly if I've missed anyone. I've only included forecasts that had either a vote breakdown per seat or anticipated odds of winning each seat for comparison purposes. I'm not claiming to be the second best, but it's important to note that being best in one measure doesn't necessarily mean best overall. There are also harder-to-evaluate measures in play here - for instance VisualizedPolitics and TooClosetoCall allow you to input poll values to see reactions for yourself, and both improved when given more accurate data (VisualizedPolitics also got to 83 seats accurately predicted, though still with a low R-squared value). 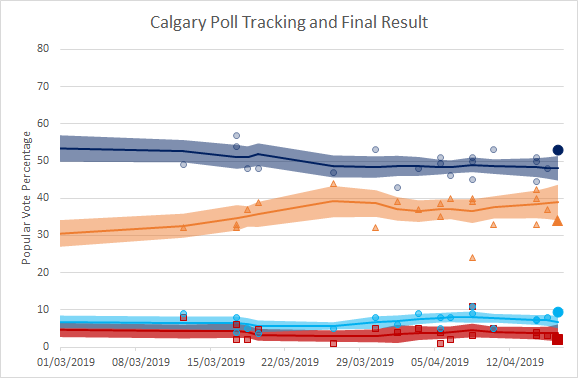 338Canada probably rightly can claim to have been the strongest this time around, but I given the polling errors we were faced with I think it'll take several more elections to determine if anyone is really getting a significant edge consistently. This isn't the first time we've compared ourselves to each other, and I think it's an important exercise in evaluating our own models and whether there's a need for more. London (Ontario) just had its first election using instant-runoff balloting. As I've mentioned before, I'm very interested in different forms of electoral reform, so as a new resident of London I was intrigued as to how the vote would work out. London's system is a bit unusual inasmuch as voters can only rank their first three choices, but otherwise follows a pretty classic Instant Runoff system. 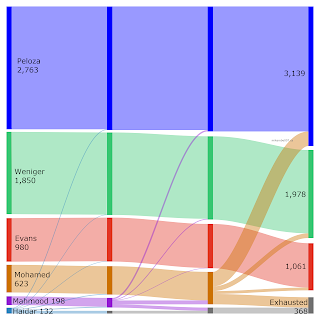 Many of the elections resulted in first round winners, and therefore don't have a lot of room for fun analysis, but some of them went deeper and I thought it might be fun to show how the progressed in a Sankey diagram! As with all of the following, the leader in the first round ultimately ended up winning. 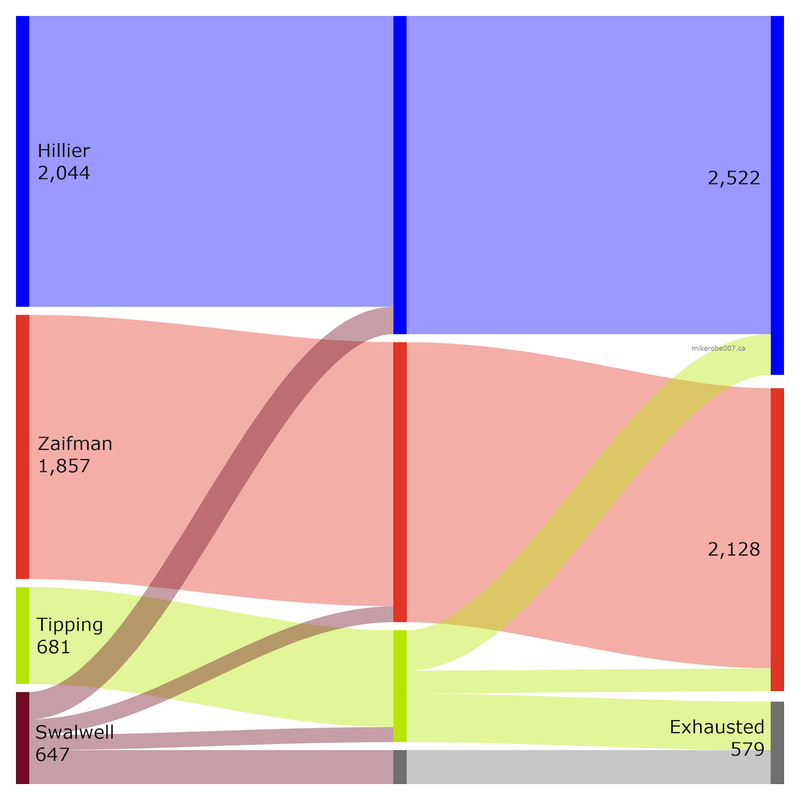 Due to the lack of ability of voters to rank more than three candidates, the number of exhausted votes tends to grow quite quickly after the third round. 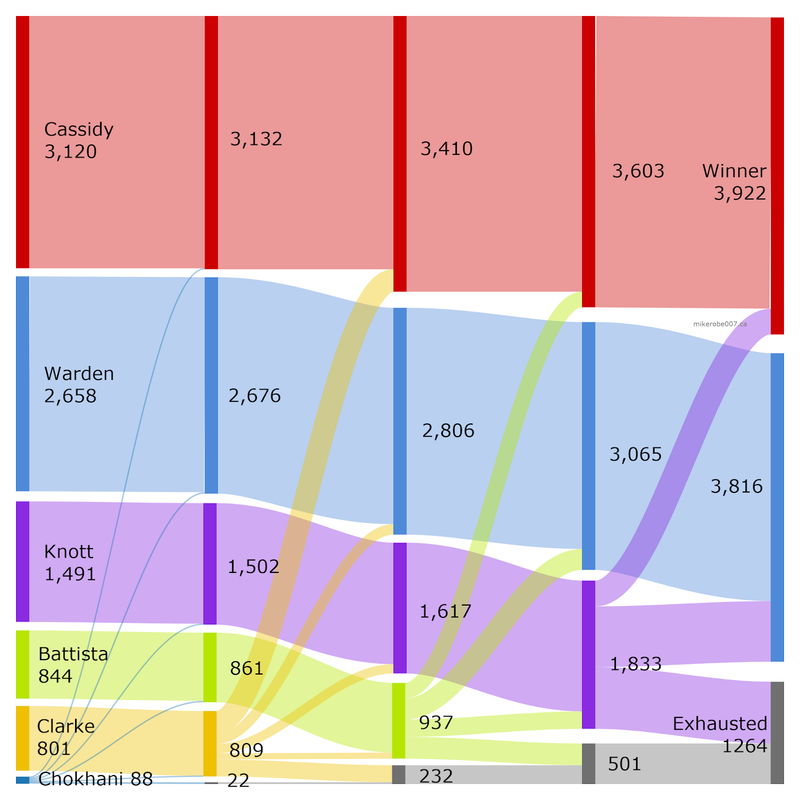 Interesting patterns include the large number of Clarke supporters moving to Cassidy, and the relatively large number of Knott supporters preferring Warden over Cassidy at the end. This race ended closer than it began, and likely didn't see any change in leader throughout the race due to the lack of strong trends in down-ballot rankings. 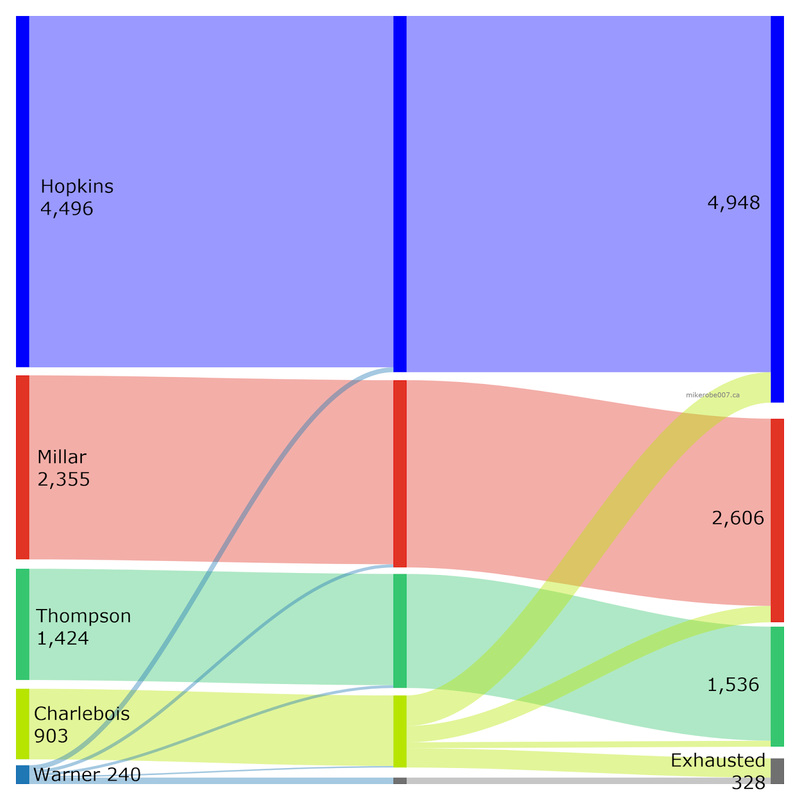 This race ended quite quickly, with Hopkins getting more than 50% of the vote by the third round after preferential support from Charlebois' supporters. 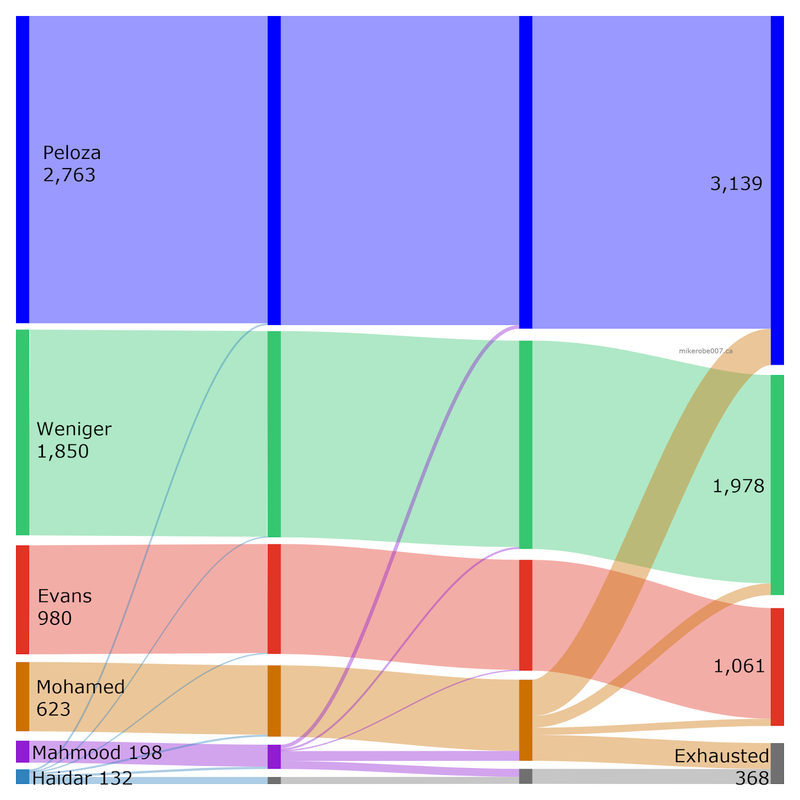 Similar to Ward 9 - disproportionate support from Mohamed's voters to Peloza secured a win in the fourth round. One of the tighter races of the election. 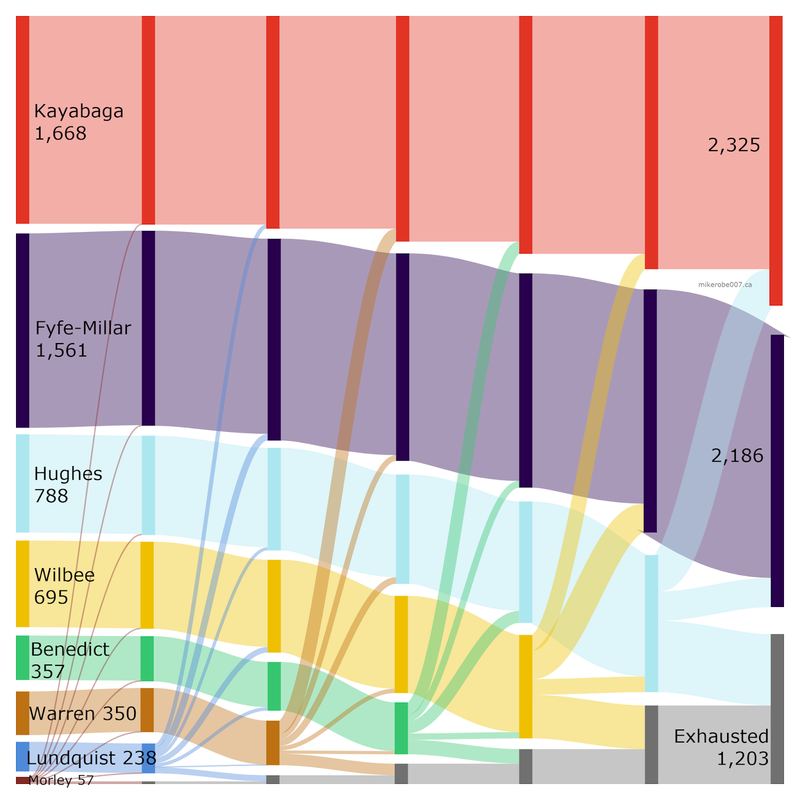 Kayabaga drew large support from Warren and Hughes supporters, whereas Fyfe-Millar drew more support from Wilbee and Lundquist voters. 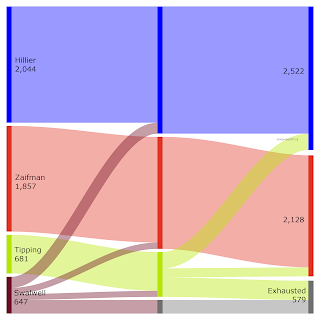 Pretty straightforward - along with being the top first choice, Hillier was the preferred alternate for both Tipping and Swalwell's voters leading to a more secure finish than start. This one was far more lopsided than all the others. In the early rounds of voting, there was a small amount of jostling for positions 7-9 in the rankings, but apart from that no real changes occurred until Cheng's elimination. No abnormally strong trends in down-ticket voting occurred, though, so Holder held one throughout the end. The city clerk has promised more detailed information to come out soon, so stay tuned for further analysis! Wow it's been a while since my last post. My apologies! A principal reason for this is that I've moved - I'm no longer an Edmontonian, and am now a Londoner! London Ontario, that is. This almost definitely means I won't stop posts about Edmonton, but does mean that I'll be increasing my Ontario content. London is currently in the midst of a civic election, so like any good new citizen to a city my first thought was to learn as much about the current council as I can so that I can make as informed a decision as possible. 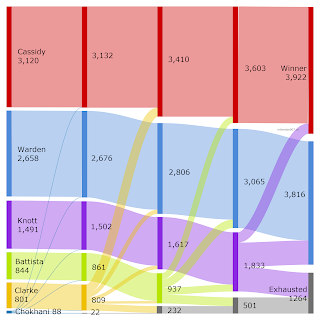 London's open data is pretty good, but their votes and proceedings aren't as organized quite as well as Edmonton's are. 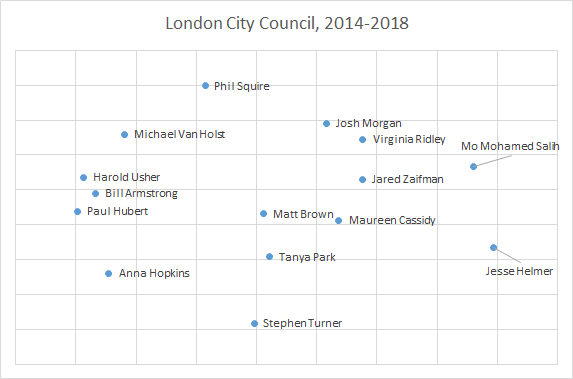 Nonetheless, with the votes and proceedings that are available, I thought to take a look at council relationships in London in a similar way to how I did in Edmonton two years ago. Matt Brown is the mayor, and currently enjoys at least 70% agreement with 11 out of 15 councillors, which isn't too shabby. In general, there appears to be a mild bloc of six people (Brown through Park) who all agree quite strongly with each other, another similar block (Park through Hubert) who do the same, and then a handful of councillors who seem to go their own way. The mayor has been on the losing side of 51 votes out of 610 in which he's been present or not recused, which suggests a reasonable level of consensus building (though not quite as high as Iveson in Edmonton). The cut-off here was chosen in order to include councillor Turner while still highlighting differences in agreement rates. 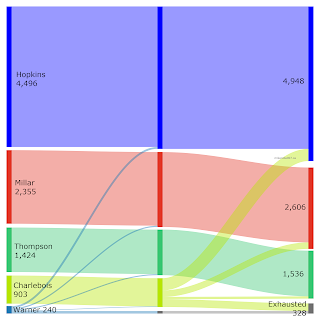 Unsurprisingly, councillors Turner, Helmer, and Squire are relative outsiders, with a strong cluster of the six councillors mentioned before in the center. Also, this type of graph is incredibly satisfying to play with - enjoy at your own risk! Here we get a more interesting structure. Nearly as many people agree more often with councillor Zaifman than Mayor Brown, though there are no separated islands of voting blocs. Only two members of council agreed with each other the most mutually, Matt Brown and Maureen Cassidy, an observation that is provided without further commentary. 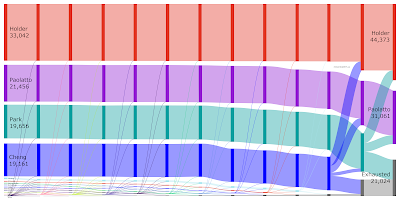 The last way I'll look at voting patterns is to scale them using a variant of NOMINATE. This method was developed for analyzing US Congress voting patters, and can assign voting members to a political spectrum without needing to know what the bills being voted on were. For more information, this link is a fascinating read. Obviously a city council is going to be less partisan than a parliamentary system, but the relative placement of councillors on the graph correlates with how often the agree or disagree with each other, as well as an approximate alignment on issues. I'll detail how this was developed in a subsequent post, but the short version is that each vote is also given a numerical position, and councillors who are closer to the "yes" vote than the "no" vote are assigned probabilities to vote either way. This is then trained against the actual vote data, and thousands of iterations of machine learning later we get this distribution. Hopefully this has been an interesting glimpse into London city council. Have a fun election! 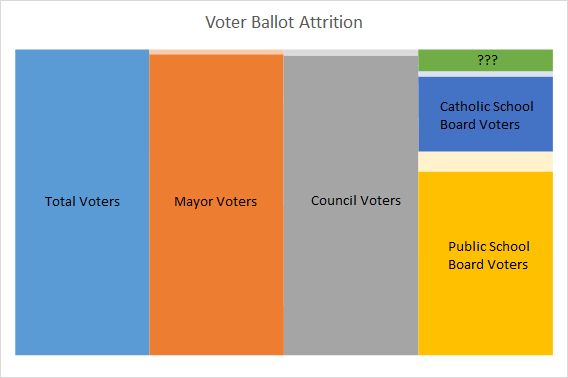 A few months ago, the Alberta Electoral Boundaries Commission released its report with recommendations on how to redistrict the province for the 2019 election. As I discussed before, this is an important process that occurs every eight to ten years, and is necessary for keeping the provincial electoral boundaries up to date with current population distributions. As a quick aside, I'd like to thank everyone who, after reading my post on redistributing using the shortest splitline algorithm, actually wrote in to the commission to tell them to do that. Thanks guys! Redistricting is always a hot topic, as it can lead to accusations of tampering or gerrymandering by those in power. In Alberta the process is ostensibly done by an arms-length body, and as such when the results were unveiled in October the complaints were pretty tame from the parties not in power. The major effect of the redistricting was to merge rural ridings in such a way that three more urban ridings were created. 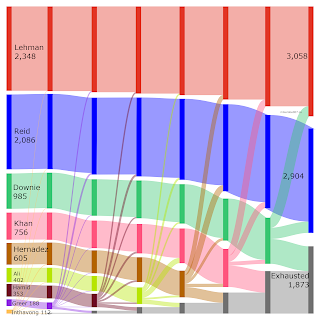 Here, each poll is shaded a darker colour if the party won by 50% of the vote or more. It's pretty fun to zoom around in it! This map is coloured the same way as the poll map above. The next election is a little over a year away, and these will be the ridings to be determined in that election. Stay tuned as I work to better develop my seat projection model and poll tracker over the next year! The colouring of the map is a bit funky since the mean and median are rather far apart, but it gives a decent impression of what happened. In general, it looks like neighborhoods around the river valley voted more often than neighborhoods away from it, which is interesting. The massive difference between the high (66.9%) and low (9.3%) turnout is absolutely astounding to me, and might suggest fairly significant challenges with connecting with voters in certain areas (especially if they can't see the river, apparently...). 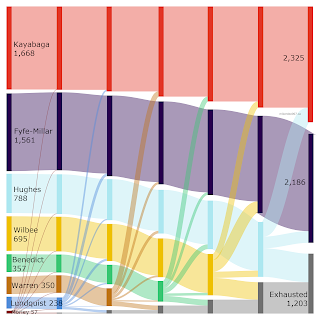 Lighter colours represent 'under votes', or people who didn't make a pick for that particular round of voting. Don Iveson was re-elected mayor with a solid victory. 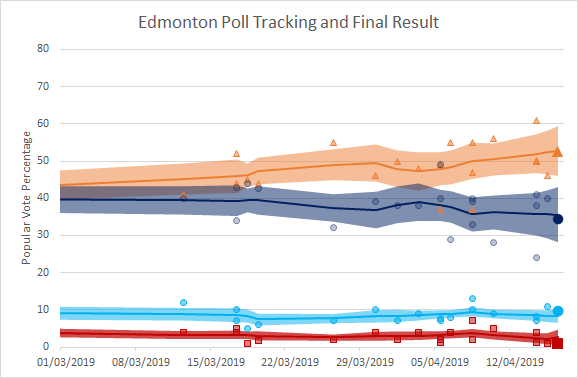 His support levels in Edmonton aren't dissimilar from last election, and are shown here (darker colours meaning higher support). Iveson's support in general seems very solid in the center of the city, and a bit weaker in the north and southeast than the rest of the city. All that being said, his support ranged from 59.5-85.9% so he has a strong mandate from every part of the city. I'd say this supports the theory from last election - last term, McKeen, Esslinger, Knack, Walters, and Henderson all voted alongside the mayor on more than 80% of non-unanimous votes, while Banga, Caterina, and Nickel (76%, 75%, and 46%, respectively) agreed with the mayor less frequently. While the mayor has had a strong track record of gaining majority support for non-unanimous bills, it does seem as though the candidates who do better in polls where the mayor does worse to tend on average to disagree with him more often than not. That suggests that perhaps this council will be a little bit closer in voting record than the last one - the four new councillors all showed up in the middle of the pack for mayoral correlations, so likely either they are wildcards for agreement with the mayor, or as new candidates their reputation hasn't yet been tested. Only time will tell! Back in October I took a quick look at the success rates of female candidates getting into city council. In 2013, 22% of candidates were female, but only one out of the twelve council seats ended up being held by a woman. 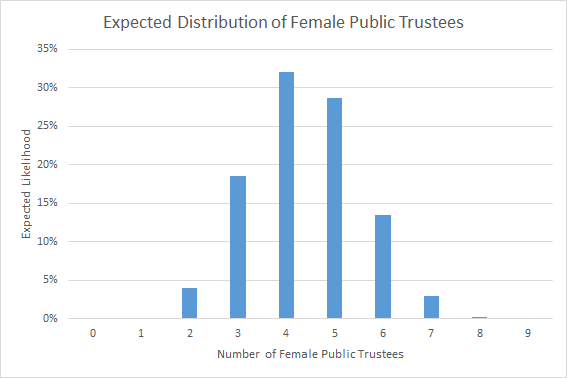 The aim of that post was to investigate some of the source of the gender disparity on council - namely whether the distribution of female candidates in different races was causing the issue, or whether there was an inherent bias against female candidates. Ultimately, I determined that the relative lack of successful female council winners was more likely due to distribution of candidates across races than individual bias - without accounting for incumbency, there was no evidence of anything other than relative equal chances of winning between female and male candidates (i.e the number of female winners since 2004 is more or less what you'd expect assuming all candidates are equally likely to win). That was a pretty positive sign, as it suggests that the biggest factor holding back a demographically-balanced council is the availability of under-represented candidates to run (which is totally outside of the scope of this blog to discuss), and perhaps more importantly, the avoidance of clumping of under-represented demographics into the same few races. One of the biggest issues with the 2013 election was that five wards had no women running at all, and half of all women were clustered into two ridings. This drastically reduced the expected number of women into council, regardless of the relative proportion of candidates who put their names forward. So with all that said, I've been keeping track of candidates for the 2017 civic election which are being tracked at Daveberta. For each candidate, I've tried to ascertain their gender in order by how they refer to themselves (political candidates love speaking in the third person), or how they're referred to in third party posts, and if all else fails by name and presentation assumptions. If you notice any errors, please let me know. Based on the current 71 candidates, 23 are female and 48 are male (female ratio of 32.4%, up from 22% in 2013). However, based on the distribution between wards, an expected 3.89 seats will be won by female candidates, which could be considered a relatively inefficient allocation of seats based on the ratio of candidates. 2 wards have no women running at all. 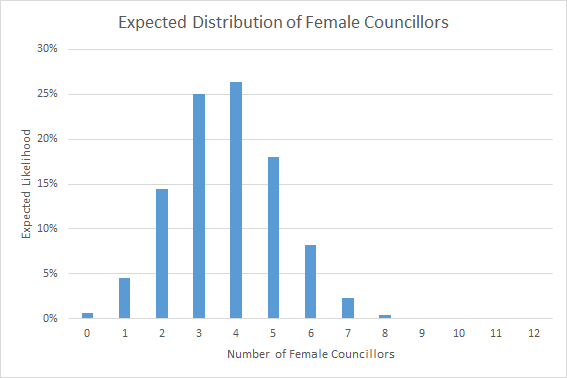 Overall, it's most likely that the number of female councillors after the election will be between 2 and 6 (90% confidence). Now that the official nomination deadline has passed, these numbers ought to be pretty official! All in all, women running for city council are still a bit poorly distributed, leading to an expected under-representation of about 0.15 seats. 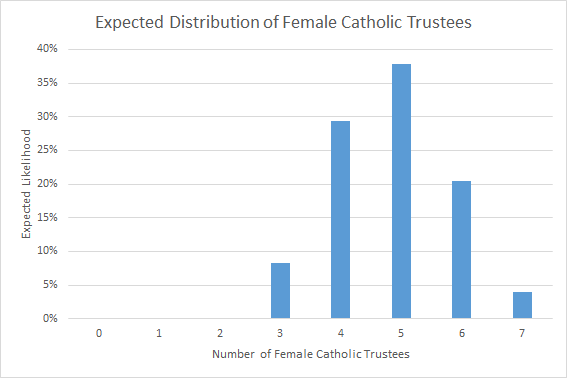 On the other hand, men tend to be poorly distributed in the school board races, leading to expected over-representations of 0.28 and 0.86 seats for Catholic and Public boards respectively. 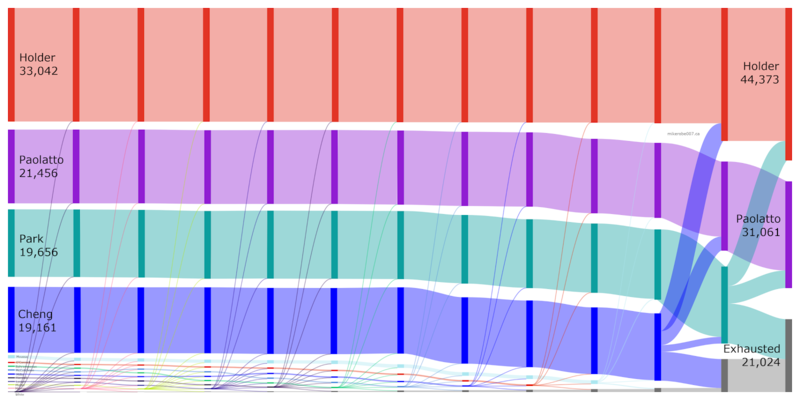 All in all, the candidate distributions are fairly balanced though, and this is certainly a fairer election gender-wise than 2013.